Our ladies are not only hard-working, they are fabulous in their charitable efforts. I received the following information for you to take note of and participate in, if you so choose. If you have information regarding a bona fide charity or charitable fundraiser or cause, I’ll do the same for you at no charge. If you’d like for me to send out information about your business or for-profit venture, check out our advertising information. Ines Murray, with JCM Building Services and Mary Kay Cosmetics fowarded this flyer for the Laces for Love footwear donation. This effort ends April 30th, so clean out your closets now – – it’s a great excuse for you to get new shoes (who doesn’t love that?) and a great thing that you are doing for those less fortunate. United for Families invites the everyone to its Fourth Annual Community Breakfast to Stop the Tears, at 8:30 a.m., April 26, at the newly renovated Lyric’s Flagler Center, in downtown Stuart. This is a free breakfast event with the sole purpose of educating the community about United for Families and all the great work that they do on the Treasure Coast. For more event details, click here. The Harvest Food and Outreach center is in need of food for their emergency pantry now and during the summer. Attached is a flyer from Vicki Hoyos detailing the types of items that they need. Please help them if you can. There is no donation that is too small. 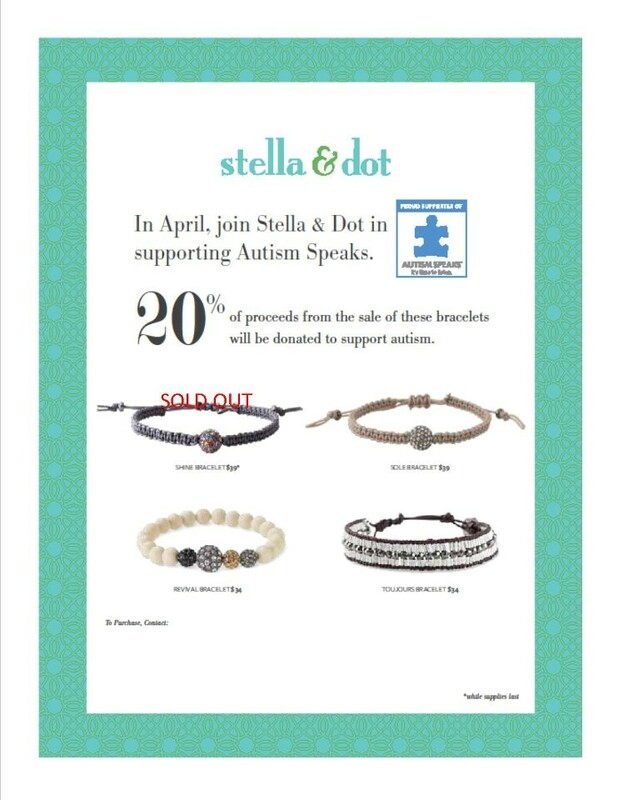 Gladys Gomez announces that her company Stella & Dot is donationg 20% of the proceeds on certain bracelets during the month of April 2012 to Autism Speaks. Here’s an idea, get the moms in your life a beautiful Stella & Dot bracelet and support this great cause. Here’s the flyer. To purchase your braclet simply contact Gladys. Let’s support one another where ever we can!